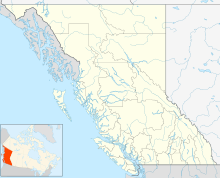 Williams Lake Airport or Williams Lake Regional Airport, (IATA: YWL, ICAO: CYWL), is located 4.2 nautical miles (7.8 km; 4.8 mi) northeast of Williams Lake, British Columbia, Canada. ^ "Directory: World Airlines". Flight International. 2007-04-10. p. 60. Wikimedia Commons has media related to Williams Lake Airport. Past three hours METARs, SPECI and current TAFs for Williams Lake Airport from Nav Canada as available. This page was last edited on 20 April 2017, at 16:02 (UTC).